If you follow a few travel message boards you will see the ‘dress code for women’ question pop up from time to time. That and teaching a few classes on cultural made me a bit more sensitive to the question. So here I go with what I saw in Nepal. Personally, me being from India, decoding the dress code in Nepal is not much of an issue, we are quite similar. I personally I think Nepali women are better dressed but then for me a jeans and a well worn T-shirt is haute couture. So don’t go by what I say. 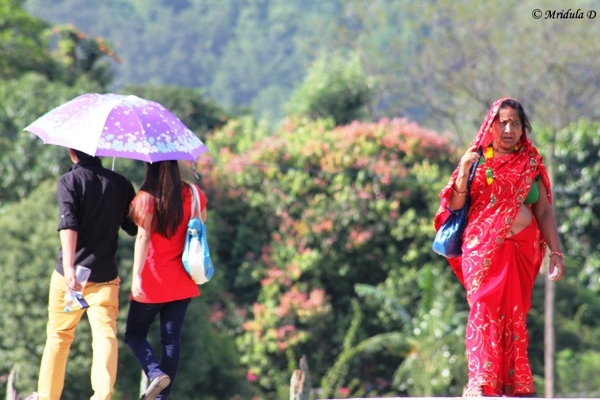 So this first picture is from Thamel, Nepal which is the tourist hub and these three Nepali girls were walking through, as you can see in various western dresses. The pictures I use in this post are clicked either at Kathmandu or Pokhara. 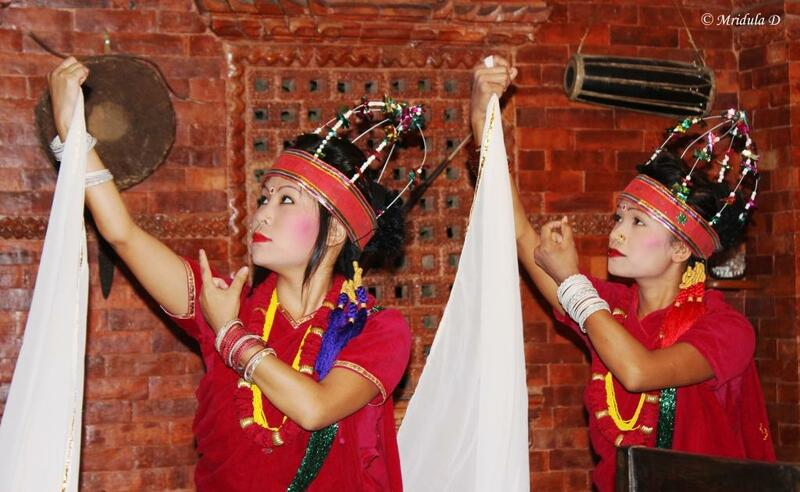 Kathmandu is the capital city and Pokhara a bigger tourist place. However even on my treks I found younger local women wearing jeans and trousers quite commonly. And if it is not cold T-shirts are fine everywhere. 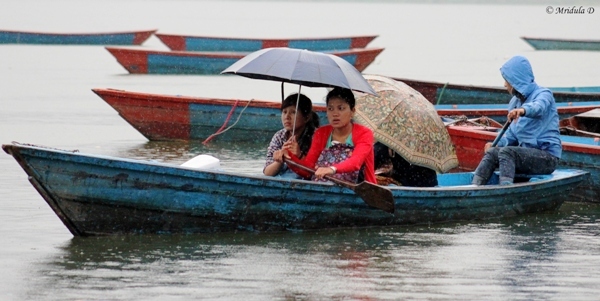 At Phewa Lake in Pokhara you will find boat women plying tourist boats and some of them dress in their traditional dress. However, a lot of local girls would I am sure use them only for special occasions, so obviously no one expects tourists to wear it. Also dresses would be different by region and clans I guess. For example, people from nearby villages come to Pokhara in their boats and you can see the women less traditionally dressed as they came for some personal work and were returning to their village by boat. Then there was a group moving together and you can see people wearing everything from a Sari, to Salwar Kurta to trousers to long skirt, all in the family or the group. 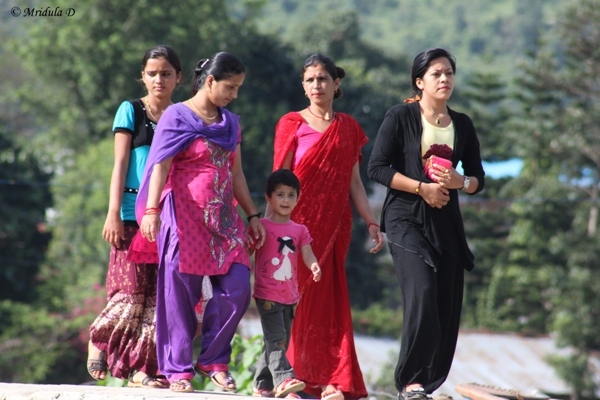 Now don’t you agree that Nepali women have a great sense of dressing and they look like young people anywhere in the world? And both of them look so sure of themselves! And then there was this girl who was all eyes only for her cell phone, she was so busy! 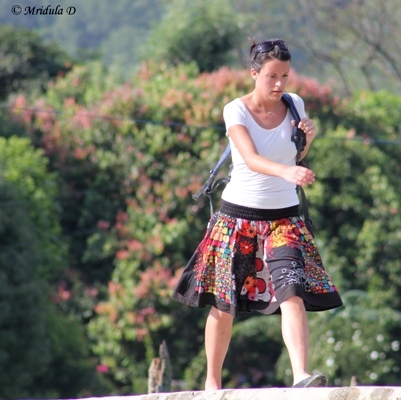 So wearing knee length skirt is also fine, at least in Pokhara and Kathmandu. And then there was this tourist who seemed to be in a rush and quite comfortable with her attire as was the local girl in the other picture. So while in countries like Nepal, India, Sri lanka people still dress traditionally, it is not that it is the only way to dress. You can find people in a sari and a couple in western attire in the same frame. And it is not that no one wears a shorts! As I said all the pictures were either clicked at Pokhara or Kathmandu which gets a lot of tourists. And I hope seeing some of these images would help you decide how the local women and tourists dress in these places at Nepal. Hope it will help you decide what to wear in Nepal. Puru from Above the Himalayas took me for a dinner at Satkar Restaurant in Thamel, Kathmandu. It is not in main Thamel where you can stumble upon it so I am doubly glad I went. 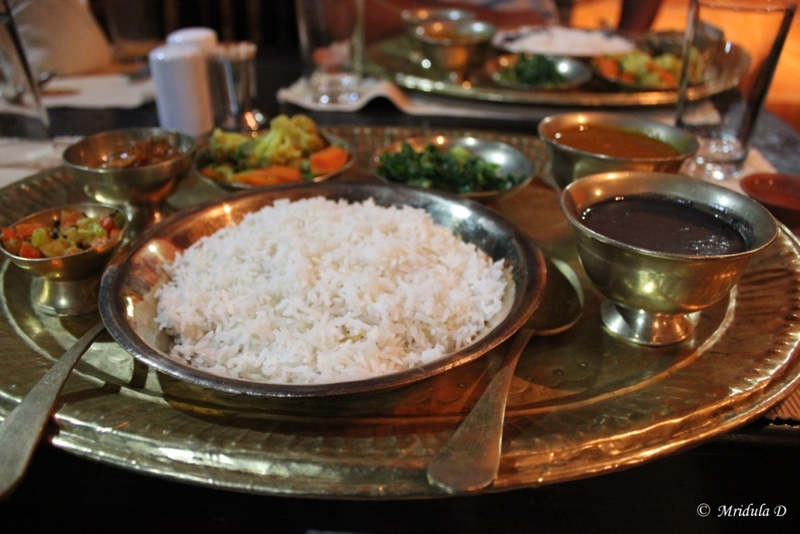 They serve great Nepali thali and being a vegetarian I can talk about that only. 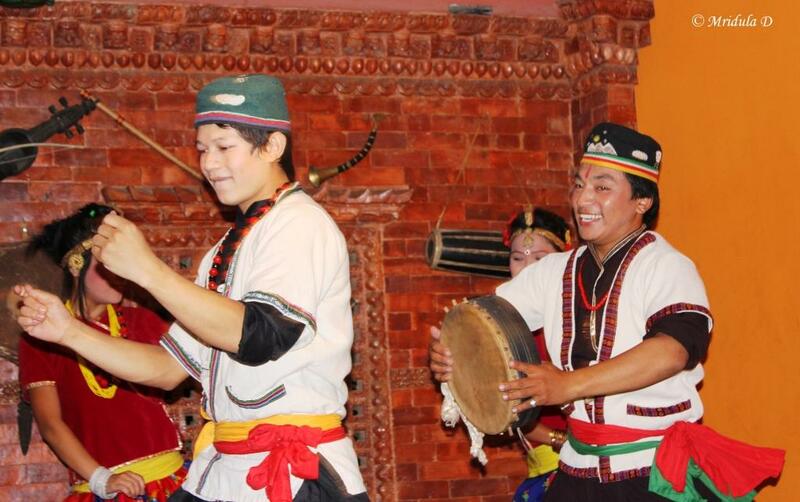 It was good food and the dances were quite enjoyable. They had served Momos before and I now wish I had taken a picture of it. But the conversations I had with Puru were so interesting that I didn’t reach out for my camera much. I did reach for my camera for these pretty dancers though. They put up a dance performance for sure in the evenings and I am glad I got to watch it. Here is another picture from the performance at Satkar. Adding another food thought, they (and many other restaurants at Kathmandu too) serve popcorn with drinks and I think it was a great idea! And I will leave you with this image for today. 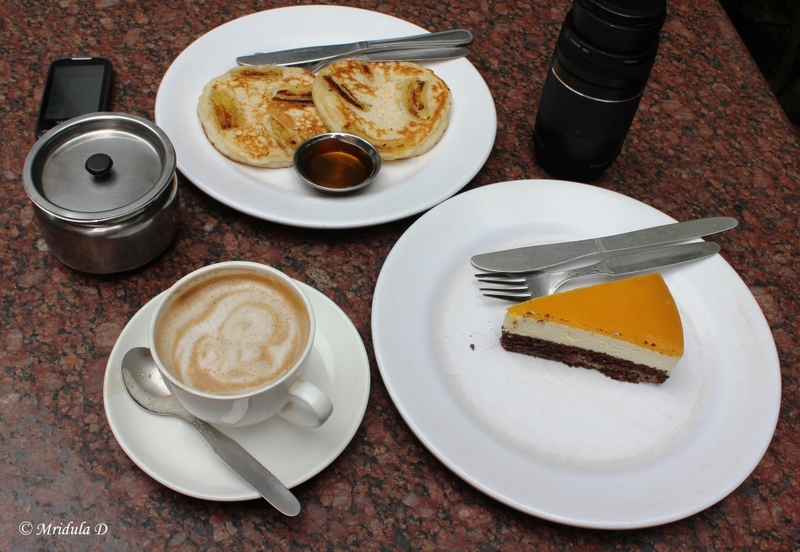 If you have read my Everest Base Camp Trek accounts (I know I keep going back to them, looks like I have left a piece of my heart on the route) by the end I was longing for cakes and pan cakes. I had them all and at that point of time without any guilt about calories! Diana had recommended Pumpernickel Bakery at Thamel, Kathmandu and it was an excellent recommendation. However in a desperate attempt to move on, two new trips are on cards, just on cards, planning about them. One could be in June itself to Sikkim and I am keen on doing Valley of Flowers sometime in July.